I made this Cashew Caramel Apple Cake inspired by our apple picking adventure the other day. Let me just say it was delightful, as apple picking should always be. And it ended in freshly made apple cider donuts. The best! 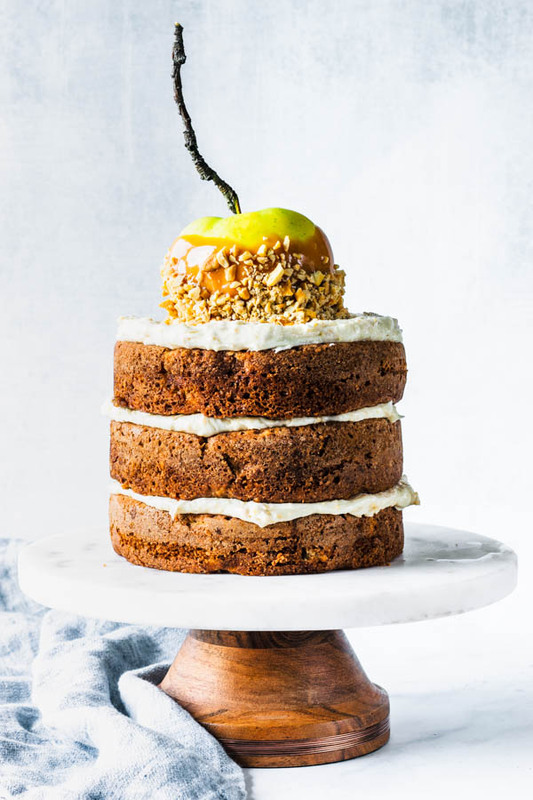 Layers of cashew and apple cake, frosted with cashew buttercream. Covered with a caramel apple coated in chopped cashews. 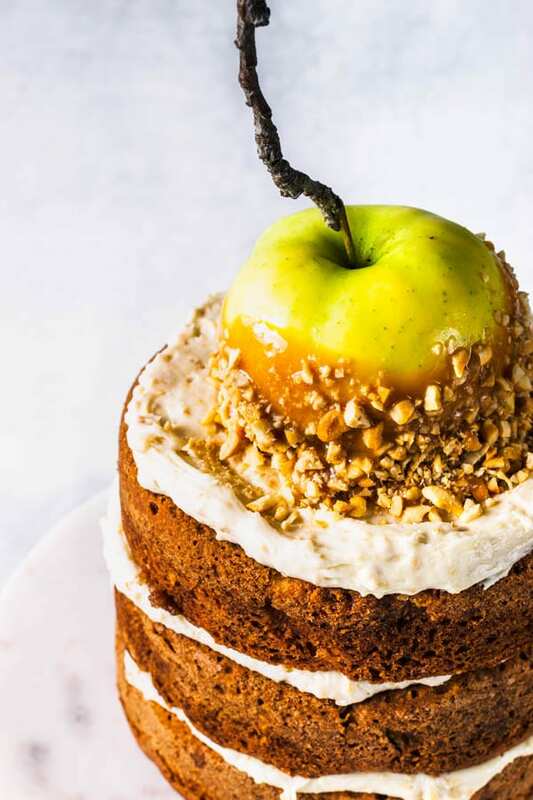 Now if you are asking yourself how to serve this cake so everyone gets a bit of the best part (the caramel apple). 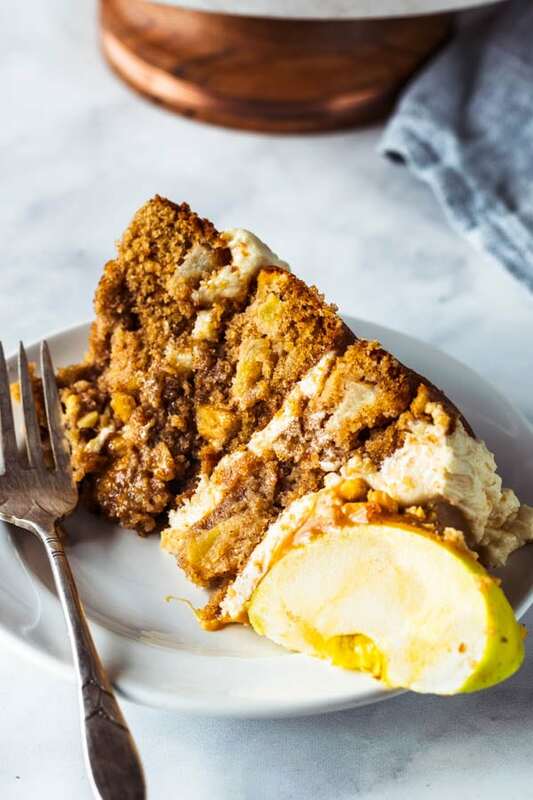 If when you are cutting, the apple starts to make the middle of the cake sink as you slice, then remove the apple and slice it on the side, and serve it with the cake slices. What a moist, indulgent, warming cake. Perfect for a fall day. 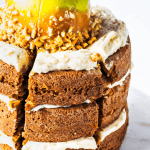 This is the perfect fall cake, really. For me, at least. The caramel apple was the highlight, the cashew buttercream was a close second. And the delicious cake itself was really the perfect vessel for delivering this delicious frosting to your mouth. I mean, seriously how moist is that! 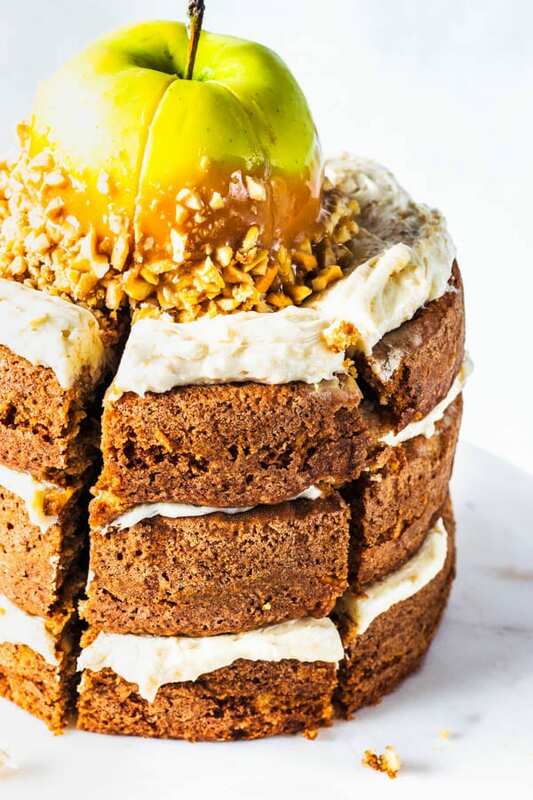 This Cashew Caramel Apple Cake will be impossible to resist. The apple on the top called my attention because it just looked so rustic, so I decided to make the best of it for my cake. You don’t have to use an apple with a crazy stem though. I just thought it was one of the cool looking apples from out apple picking adventure. Which made this cake special, on top of ridiculously delicious. 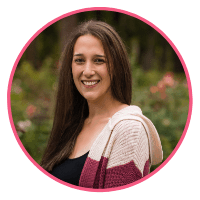 Thanks for reading, friends! Have a fabulous time! If you want to check out other desserts, here are some of the favorites on the website this week: Lemon Coconut Layer Cake, Lemon Macarons, Flan Cake, Cashew Caramel Babka. Cashew Caramel Apple Cake. 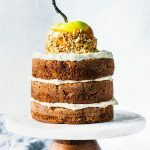 Layers of Cashew and Apple cake, frosted with Cashew Buttercream. Topped with a Caramel Apple covered in chopped cashews. Grease and line with parchment paper the bottom of 3-6” cake pans, or 2-8” cake pans. With the 8” the cakes might be slightly thinner. Start by sifting the flour, cinnamon, baking soda, baking powder, nutmeg, and salt together. Set aside. Cream butter with an electric mixer for about 2 minutes. Add the sugars in and cream at medium high speed for another 1-2 minutes, as long as it takes to get really fluffy and lightened in color. Add eggs, one at time. Incorporate one egg before adding the other. Scrape your bowl in between. Add apple sauce and vanilla extract, mix until combined. Add apples and cashews. Mix and divide between the cake pans. Bake for 15-25 minutes, depending on the pan sizes you chose. When you touch the surface of the cake, it should spring back. That’s the best way to tell your cake is done. Also the cake should let go from the side of the pan, and that’s another sign your cake might be done baking. Remove baked cakes and let them rest for 10 minutes. Flip them onto a cooling rack and leave them until they are completely cooled down. At this point, I like to wrap my cakes in plastic wrap and keep them in the fridge for a couple of hours at least, so they are easier to manage when assembling. In a bowl, cream together the cream cheese and butter for 2 minutes. Add powdered cashews. Mix until combined. With the mixer off, add powdered sugar to the bowl. Stir on slow until incorporated, then raise the speed and cream mixture for 1-2 minutes. Start by adding only the 3 cups of powdered sugar in, and add more as needed for consistency. If the frosting is too runny, add more sifted powdered sugar, and if it’s too stiff, add 1 or 2 teaspoons of milk. Spread about 1/3 cup of frosting on top of each layer of the cake. I chose a naked cake design, but you might want to cover the whole cake with the frosting. Place your apple in the freezer for about 15 minutes. Unwrap the caramels and place them in a microwave safe bowl. Add milk in. Microwave at 10-20 second intervals, stirring in between, until the caramel is completely melted. Let the mixture cool for a few minutes. Remove apple from the freezer and pat it as dry as possible with a paper towel. Dip the apple in the caramel and try to coat it really well. Remove a bit of the excess. Coat apples in chopped cashews. Place apple on top of the cake. Place cake in the fridge. Keep cake refrigerated for 4-5 days. Note about the apple sauce- I make my own apple sauce by simply cooking peeled and diced apples with a stick of cinnamon, adding a little water as needed. I cook them slow and low, at a low temperature and for a long time, so they reduce quite nicely, as the apples caramelize. If you add a pear in there, you will have the most delicious apple sauce of your life, because the pear should offer sweetness to the sauce. Note about the Apples- For best results when dipping your apple in the caramel, you should remove the wax from the apples if you bought them at the store. If you picked at a farm, you probably won’t have to. To remove the wax, simply place the apple in boiling water for like 1 second. Immerse the apple in the water with a ladle and quickly remove it. Pat it dry, and put it in the freezer. When removing from the freezer, pat it dry with paper towels again to give the caramel a chance to stick to the apple. The apples being cold will also help. Note about the Caramels- The number of caramels you are going to use will vary according to the brand. Since I used Wheter's Original, I had to use 35 caramels. You might have leftover caramel, but I am sure you won’t mind dipping a couple more apples in them and eating right? Just try it, trust me, you won’t regret it. Seus pratos são sensacionais!!!!!!! Parabéns Ca. Apple cake is my favourite type of cake to eat at this time of year. Adding cashews to it sounds great! I’m on a huge apple kick right now, and everything about this cake sounds amazing. This will have to be my next fall baking project. Can’t wait to try it! This is such a creative cake ~ the perfect thing to serve at our Halloween party! My goodness what a beautiful cake! 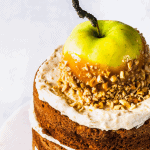 To cap off the fun of apple picking with the joy of eating this cake really must be wonderful! What a gorgeous cake! I love all of the flavors. Sure I’ll love the cake but I’m sure mine won’t look so pretty! That cashew buttercream is genius! I love the cream cheese in there and the powdered cashews!!! I am not a cake or frosting lover but that has me craving both! This photo draws me in every time I see it! Beautiful cake Camila! That apple on top really does look rustic. Nice touch!